PLM is an approach which aims to manage a product throughout its life cycle. Today, there are powerful and well-adapted tools for each phase of the product lifecycle, such as CAD (Computer Aided Design), SDM (Simulation Data Management), Enterprise Resource Planning (ERP) etc. However, their complete integration and more particularly the linkage from one phase to another are not yet fully operational and effective. To reach the PLM goal, it is necessary to guarantee the interoperability between the information systems (IS) supported by the business applications throughout the product lifecycle. Also, in the extended enterprise, from one project to another, the applications used for the product development process can change as business partners may change as well. An interoperability solution should be designed taking into account the potentially changing contexts of enterprise cooperation. A possible solution consists in designing the interoperability solution of the PLM systems by adopting the principles of the system of systems (SoS) concept. 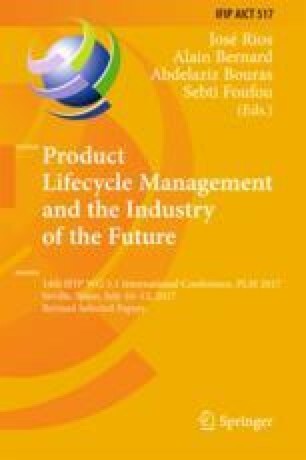 This work proposes a system of systems of PLM based on multi-agent systems to treat the interoperability, as well as knowledge capitalization issues. This work was carried out and funded in the framework of the Labex MS2T. It was supported by the French Government, through the program “Investments for the future” managed by the National Agency for Research (Reference ANR-11-IDEX-0004-02).